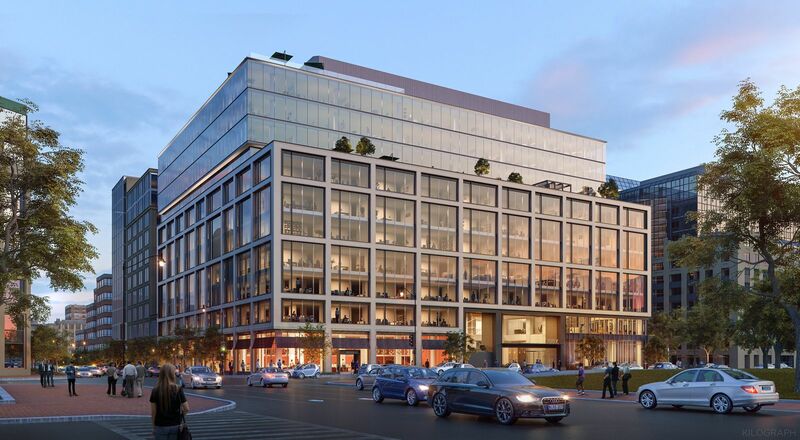 Bethesda, MD (Restaurant News Release) The Meridian Group announced today that Truluck’s Seafood, Steak & Crab House will open a fine-dining restaurant at Anthem Row, a trophy office development that’s under construction in Washington’s East End. Truluck’s, which has 11 locations in Texas, California and Florida, will lease 10,313 square feet on the ground and second floors at the corner of 7th and K streets. The full-service restaurant has signed a 20-year lease and plans to open in March 2019. “Truluck’s offers an elegant dining experience, and we are thrilled to welcome this renowned restaurant to Anthem Row and Washington, DC,” said Tom Boylan, Vice President of The Meridian Group. Anthem Row is a four-building complex formerly known as Techworld Plaza. The Meridian Group has launched an extensive renovation of the 12-story building at 800 K Street, creating a trophy development with a dynamic retail platform. Streetsense brokers Jared Meier and Andrew Poncher are representing Meridian on the project’s retail leasing. They’ve already had considerable success. In December, Equinox announced it will open a luxury full-service health club at the development. Equinox, which operates dozens of upscale, full-service clubs globally, will lease 33,817 square feet. Anthem Row is ideally situated in the core of Washington, DC’s East End, the city’s most vibrant office and retail submarket. The development is directly across from the future global flagship location of Apple at the historic Carnegie Library. The original building at 800 K Street has a large floor plate with two cores and one main lobby accessible from the 8th Street plaza. After the renovations, the property will function as two buildings with separate identities and main lobbies. The buildings will also have separate addresses – 700 K Street and 800 K Street. The building at 700 K will provide 246,403 square feet of trophy office space –with typical floors ranging from 22,200 to 28,600 square feet. The building at 800 K (the “Octagon”) will provide 113,191 square feet of boutique Class A space — with typical floors ranging from 11,000 to 13,600 square feet. Underlying it all will be three levels of retail space totaling 76,000 square feet. Flanking the new 700 K Street lobby on both sides will be new, expansive retail space located on the corners of 7th and 8th streets and extending down the pedestrian promenade, or “Anthem Row.” This renewed pedestrian thoroughfare along 8th Street will be appointed with new planters, pavers, benches, streetlights and outdoor seating areas. Truluck’s will be part of this dynamic retail space, which is ideally situated in an enviable location with high visibility along 7th Street. The restaurant will be just steps away from the Capital One Arena and adjacent to CityCenterDC, the Marriott Marquis and the Walter E. Washington Convention Center. JLL’s Evan Behr and Doug Mueller represent Meridian on 700 K’s office leasing. Demand from tenants is already growing, in part because of the development’s prime location. The East End features signature restaurants, shopping, hotels, high-end residential communities and the largest and most stable supply of office space in Washington. “This is a phenenomal place to be,” Boylan said. The Meridian Group is a real estate investment and development firm based in Bethesda, Md. Since its inception in 1993, Meridian has acquired and developed more than 14 million square feet of office, residential, hotel, mixed-use, and land with a focus on the metropolitan Washington, DC market. To learn more, visit Meridian’s website at www.tmgdc.com.